These 3 easy radiator flush steps, using a new, easy-to-use, Hi-tech 3 item Treatment from Mega Power, raises your engine and transmission care and cooling protection to the highest level. Mega Power exceeds every car and equipment makers 50,000 mile, or every 6 years service requirements. With Mega Power, your cars and equipment future & longer engine and transmission life may be directly attributed to this products special advantages - listed below in the paragraph entitled Cooling Improvement, and Leak Protection. Step One. 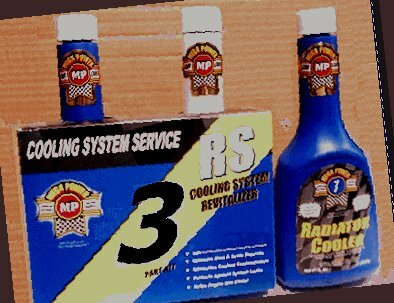 Add the MP System Flush Conditioner to your radiator coolant. After 10 to 15 minutes - you can drive with the cleaner installed. Remove the old coolant - no rinse needed nor neutralizer. Save old coolant for recycle. Step Two. Install MP System Cool and MP System Stop Leak in the radiator, and then fill the system with anti-freeze almost to within 2 inches of the full level to allow for expansion. Step Three. Idle motor 15 minutes with the heater to hot so air bubbles work out. Then top off radiator with more coolant. Replace cap. Add 1/2 quart fresh coolant to the overflow tank. Check for leaks. You're done! Your cars and equipment future & longer engine and transmission life may be directly attributed to this products special advantages - listed below in the paragraph entitled Cooling Improvement, and Leak Protection. Order Mega Power Radiator Flush Treatment Now to service all your cars. Order one Mega Power Radiator Treatment as shown. 3 items. Comes with easy-to-follow directions. Guarantee of satisfaction. Phone help if needed. Shipped to your door in 3 days by FedEx. Just $50 plus $15s&h= $65 total. Order 6 Mega Power Radiator Treatments as shown for resale or fleet usage. 18 items. Comes with easy-to-follow directions. Guarantee of satisfaction. Phone help if needed. Shipped to your door in 3 days by FedEx. Just $200 and includes shipping. Save $100. Radiator Cool works after Mega Power Cleaning uses new chemistry to removes oxygen molecules and acidic scum coatings your system interior surfaces have collected over the years. The cuase of most problems. then goes to work to extract excessive oxygen from the coolant. This Mega Power advantage allows more coolant molecules to pack closer together. More heat is absorbed into the coolant in this action and much faster. And dissipation of your motors heat to the outside is much faster - allowing your engine - and your transmission, which sends hot fluid to the radiator to be cooled, to run up to 40 degrees cooler - and operate in a friendlier cooler environ. Heat kills! Mega Power Protects! Mega Power Stop Leak has no fillers fibers or egg whites. Mega Power Stop Leak is clear and works like blood - when you get a scratch. It them coagulates and forms a scab - stopping the leak. Stop leak is permanent. And ability to stop new leaks remains - where as all other stop leaks end their action for further help in a few days. You need this Mega Power Radiator System Protection going for you full time. Avoid trouble before it starts - end it if it has taken a foot hold! Order now! Mega Power offers the highest care and protection - yet, is able to seal head gasket leaks, seal manifold gasket leaks - and even your cars interior heater core leak - easily while providing super protection. Mega Power avoids costly repairs freeing up money for other family needs! See this Demo about Mega Power for your engine and transmission care and protection! Mega Power does so by means of new Do-it-yourself chemistry that requires no neutralizing after the flush - saving time and a big nuisance step, yet Mega Power Radiator Flush cleans better than ordinary part store radiator flush products, containing caustics and sold as a traditional flush ingredient. Mega Power's cooling system cleaner neutralizes acids - the single biggest threat to your engine, and number one cause of tens of thousands of head gasket, manifold gasket and heater core leak! The 3 easy radiator flush steps, using a new, easy-to-use, Hi-tech 3 item Treatment from Mega Power, raises your required radiator care and problem solving to a new level of protection... Oder now! You know that is what your car needs! Doing so the Mega Power Radiator Flush way prevents and ends engine, transmission, and radiator system trouble for greater driving enjoyment - for years to come!